The Papal legate's and the Inquisitor's findings were against the English and this may have been the reason why the Pope did not act on the case. He did not want to antagonize the English because he hoped to enlist their help against the Moslems. Because of this setback the King's advisors decided to change tactics and had Jeanne's family bring the suit before the Pope. So two months after the election of Pope Calixtus III, Isabelle Romée and her two sons appealed for justice concerning Jeanne's case. The Pope authorized the investigation and appointed the judges. The process to right the wrongs done to Jeanne was begun on November 7, 1455. Isabelle Romée, who was now somewhere between sixty and seventy years old, her two sons and a group of friends from Orleans, came to the Cathedral of Notre-Dame. Tearfully and filled with emotion, Isabelle approached the Pope's representative judges and began to recite her request for justice for her daughter. "I had a daughter born in lawful wedlock who grew up amid the fields and pastures. I had her baptized and confirmed and brought her up in the fear of God. I taught her respect for the traditions of the Church as much as I was able to do given her age and simplicity of her condition. I succeeded so well that she spent much of her time in church and after having gone to confession she received the sacrament of the Eucharist every month. Because the people suffered so much, she had a great compassion for them in her heart and despite her youth she would fast and pray for them with great devotion and fervor. She never thought, spoke or did anything against the faith. Certain enemies had her arraigned in a religious trial. Despite her disclaimers and appeals, both tacit and expressed, and without any help given to her defense, she was put through a perfidious, violent, iniquitous and sinful trial. The judges condemned her falsely, damnably and criminally, and put her to death in a cruel manner by fire. For the damnation of their souls and in notorious, infamous and irreparable loss to me, Isabelle, and mine... I demand that her name be restored." Jeanne's mother, overcome with grief, had to be escorted to the sacristy of the cathedral and thus began Jeanne's Trial of Nullification. JEAN MOREL, of Greux, laborer. Jeanne was born at Domremy and was baptized at the Parish Church of Saint Remy, in that place. 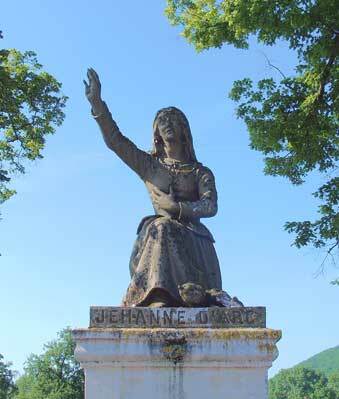 Her father was named Jacques d'Arc, her mother Isabelle - both laborers living together at Domremy. They were, as I saw and knew, good and faithful Catholics, laborers of good repute and honest life. I lived much with them, I was one of the godfathers of Jeannette. She had three godmothers, the wife of Etienne Thévenin, Beatrix, widow Estellin, both living at Domremy; and Jeannette, widow of Thiesselin of Viteaux, living at Neufchâteau. From her early youth, Jeannette was brought up with care in the Faith, and in good morals; she was so good that all the village of Domremy loved her. Jeannette knew her Belief and her Pater and Ave as well as any of her companions. She had modest ways, as becomes one whose parents were not rich. Up to the time she left her parents she followed the plough and sometimes minded the cattle in the fields. Also she did the usual duties of women, such as spinning, and other things. I know it pleased her to go often to the Hermitage of the Blessed Marie of Bermont, near Domremy. Often I saw her go there. She was there when her parents thought her with the plough or in the fields; and when she heard the Mass-bell, if she were in the fields, she would go back to the village and to the Church, in order to hear Mass. I have been witness of this many times. I have seen her confess at Easter-tide and other solemn Feasts. I saw her confess to Messire Guillaume Fronte, who was then Cure of the Parish of Saint Remy. On the subject of the Fairies' tree, I have heard that the Fairies came there long ago to dance; but, since the Gospel of Saint John has been read under the tree, they come no more. At the present day, on the Sunday when in the Holy Church of God the Introit to the Mass 'Laetare Jerusalem' is sung, called with us 'the Sunday of the Wells,' the young maidens and youths of Domremy are accustomed to go there, and also in the spring and summer and on festival days; they dance there and have a feast. On their return, they go dancing and playing to the Well of the Thorn, where they drink and amuse themselves, gathering flowers. Jeanne the Maid went there, like all the other girls at those times, and did as they did; but I never heard say that she went there alone, either to the tree or to the well which is nearer the village than the tree-or that she went for any other purpose than to walk about and play like her companions. When Jeanne left her father's house, she went two or three times to Vaucouleurs to speak to the Bailly. I heard it said that the Lord Charles, then Duke of Lorraine, wished to see her, and gave her a black horse. I have no more to say, except that in the month of July I was at Chalons, at the time when it was said that the King was going to Reims to be anointed. (Jeanne's father went also to Reims for the coronation. There still exists in the old accounts of the town an item for his expenses at the inn; and, in the Compete of the Treasurer Raguier there is also an entry of 60 livres tournois, paid Jeanne to give to her father. On the day after the coronation, Jeanne obtained from the King an exemption from taxes for the village of Domremy and Greux: this document, dated July 31st, 1429, still exists in the Archives of France. This exemption from taxes has now lapsed.) I found Jeanne at Chalons and she made me a present of a red dress she had been wearing. I know nothing of the inquiry made at Domremy. When Jeanne went to Neufchâteau on account of the soldiers, she was always in the company of her father and mother, who stayed there four days, and then returned to Domremy. I am sure of what I say, because I went with the rest to Neufchâteau and I saw Jeannette there with her parents. MESSIRE DOMINIQUE JACOB, Cure of the Parish Church of Montier-sur-Saulx. Jeanne was older than I. I knew her and remember her for the three or four years before her departure from home. She was a well brought up girl, and well behaved. She often attended Church. Sometimes, when the village bell rang for service, I saw her kneel down and pray with great devotion. BEATRIX widow of Estellin, laborer, of Domremy. Jeannette was born, at Domremy, of Jacques d'Arc and Isabelle, his wife, laborers, good and true Catholics, honest folk and worthy, according to their ability, but not rich. She was baptized at the Church of Saint Remy. She had as godfathers, Jean Morel, Jean de Laxart, and the late Jean Raiguesson; and as godmothers, Jeannette, widow Thiesselin, Jeannette Thévenin, and myself. Jeanne was suitably instructed in the Catholic Faith, like other young girls of her age. Up to her departure, she was properly brought up; she was a chaste maiden, and of modest habits. She frequented with great devotion, churches and holy places; and, after the village of Domremy was burned, she went on Feast Days to attend Mass at Greux. She confessed willingly at festivals, principally at the Feast of the most Holy Easter, the Resurrection of our Lord Jesus Christ. I do not think there was any one better than she in our two villages. She employed herself at home with many duties in the house, spinning hemp or wool, following the plough, or going to harvest, according to the season. When it was her father's turn, she sometimes kept the cattle and the flocks of the village for him. When Jeannette went to Neufchâteau, all the village had fled. I saw her there, always with her father and mother. Up to her going into France, Jeannette had never obeyed any one or worked for any one but her father. MESSIRE ETIENNE OF SIONNE, Curé of the Parish Church of Roncessey-sous-Neufchâteau. Many times I heard Messire Guillaume Fronte, in his lifetime Cure of Domremy, say that Jeanne the Maid was a simple and good girl, pious, well brought up, and God-fearing, and without her like in the whole village. Often did she confess her sins; and, if she had had money, she would have given it to him, he told me, to say Masses. Every day, when he celebrated Mass, she was there. I heard it said by a great number of persons that Jeannette, when she went to Neufchâteau, lived with a worthy woman named La Rousse; and that she always remained in the company of her father and the other inhabitants of Domremy, who had fled there. JEANNETTE, widow of Thiesselin of Viteaux, formerly clerk at Neufchâteau. I often saw her confess to Messire Guillaume Fronte, the Cure of the parish. She never swore, and, to affirm strongly, contented herself with saying, "Without fail!" She was no dancer; and, sometimes, when the others were singing and dancing, she went to prayer. Jeannette was fond of work, spinning, looking after the house, and, when necessary, taking her turn at minding her father's cattle. There is a tree by us called the Ladies' Tree, because, in ancient days, the Sieur Pierre Granier, Seigneur de Bourlement, and a lady called Fée met under this tree and conversed together: I have heard it read in a romance. The Seigneurs of Domremy and their ladies at least, the Lady Beatrix, wife of Pierre de Bourlement, and the said Pierre accompanied by their daughters, came sometimes to walk round this tree. In the same way, every year the young girls and youths of Domremy came to walk there, on the Laetare Sunday called 'the Sunday of the Wells' : they ate and danced there, and went to drink at the Well of the Thorn. But I do not remember if Jeanne were ever under this tree. I never heard anything evil said about her on account of this tree. LOUIS DE MARTIGNY, Squire, living at Martigny-les- Gerbonveaux, near Neufchâteau. I heard that Jeanne, when she wanted to go into France, went first to the Bailly of Chaumont, and afterwards to the Lord Duke de Lorraine, who gave her a horse and some money. Bertrand de Poulengey, Jean de Metz, Jean Dieu-le-Ward, and Colet de Vienne afterwards conducted her to the King. BERTRAND LACLOPPE, thatcher, of Domremy. One day, a man (Durand Laxart, her uncle.) of Burey-le-Petit came to seek Jeanne at Domremy, and took her to speak with the Bailly of Vaucouleurs: I heard say that it was this Bailly who sent her to the King. The soldiers having come to Domremy, all the people of the village went to take refuge at Neufchâteau. Jeannette and her parents did as the others did: she stayed there about four days, always in their company. PERRIN LE DRAPIER, of Domremy, Church warden of the Parish Church and Bell-ringer. From her earliest years till her departure, Jeannette the Maid was a good girl, chaste, simple, modest, never blaspheming God nor the Saints, fearing God. She loved to go to Church and confessed often. I can attest what I say, for I was then attached to the Church of Saint Remy, and often I saw Jeanne come there to Mass and other Offices. When I forgot to ring for Service, Jeanne scolded me, saying I had done wrong; and she promised to give me some of the wool of her flock if I would ring more diligently. Often she went with her sister and others to the Church and Hermitage of Bermont. She was very charitable, and very industrious, employed herself in spinning and divers other works in her father's house; sometimes she went to the plough, or took care of the flock when it was her turn. When Jeanne left her father's house, she went with her uncle Durand Laxart to Vaucouleurs, to seek Robert de Baudricourt, who was then captain there. GERARD GUILLEMETTE, laborer, of Greux. When Jeanne left her father's house, I saw her pass before my father's house, with her uncle Durand Laxart. "Adieu," she said to my father, "I am going to Vaucouleurs." I heard afterwards that she had gone to France. I was at Neufchâteau with Jeanne and her parents. I saw her always with them, excepting that, for three or four days, she did, under their eyes, help the hostess at whose house they were lodging, an honest woman named La Rousse. I know well that they only remained at Neufchâteau four or five days. When the soldiers had gone, Jeanne returned to Domremy with her parents. HAUVIETTE, wife of Gerard of Syonne, near Neufchâteau. She was a good girl, simple and gentle; she went willingly and often to Church, and Holy places. Often she was bashful when others reproached her with going too devotedly to Church. There was a tree in the neighborhood that, from ancient days, had been called the Ladies' Tree. It was said formerly that ladies, called Fairies, came under this tree; but I never heard any one say they had been seen there. The young people of the village were accustomed to go to this tree, taking food with them, and to the Well of the Thorn (This is also called the "Fontaine aux Groseilliers"; the Latin name is probably intended for Rhamnus, the Buckthorn.) [Ad fontem Rannorum, or, "ad Rannos"] on the Sunday of 'Laetare Jerusalem.' (Mid-Lent Sunday, the 4th Sunday in Lent; so-called, because the introit for the day begins, "Laetare Jerusalem," ) called the Sunday of the Wells. I often went there with Jeanne, who was my friend, and with other young girls on the said Sunday of the Wells. We ate there, ran about, and played. Also, we took nuts to this tree and well. I did not know of Jeanne's departure: I wept much ; I loved her dearly for her goodness and because she was my friend. Jeanne was always with her father and mother at Neufchâteau. I also was at Neufchâteau, and saw her there all the time. JEAN WATERIN, laborer, of Greux. I saw Jeannette very often. In our childhood, we often followed together her father's plough, and we went together with the other children of the village to the meadows or pastures. Often, when we were all at play, Jeannette would retire alone to "talk with God." I and the others laughed at her for this. She was simple and good, frequenting the Church and Holy places. Often, when she was in the fields and heard the bells ring, she would drop on her knees. Of her departure for Vaucouleurs I know nothing. But, at the time when she was thinking of leaving the village, she said to me, one day : "Gossip, if you were not a Burgundian, I would tell you something." I thought it was on the subject of some marriage which she might have in her head. After her departure, I saw her at Chalons, I and four other inhabitants of this place. She told us she feared nothing but treason. SIMONIN MUSNIER, laborer, of Domremy. I was brought up with Jeannette, close to her house. I know that she was good, simple and pious, and that she feared God and the Saints. She loved Church and Holy places; she was very charitable, and liked to take care of the sick. I know this of a surety, for, in my childhood, I fell ill, and it was she who nursed me. When the Church bells rang, I have seen her kneel down and make the sign of the Cross. ISABELLETTE, wife of Gerardin, laborer, of Epinal. From my childhood I knew the parents of Jeannette; as to Jeannette, herself, I knew her in my youth and as long as she remained with her parents. She was very hospitable to the poor, and would even sleep on the hearth in order that the poor might lie in her bed. She was not fond of playing, at which we, her companions, complained. She liked work; and would spin, labor with her father, look after the house, and sometimes mind the sheep. She was never seen idling in the roads; she was more often in Church at prayer. I often saw her at confession, for she was my gossip, and god-mother to my son Nicolas. I was often with her, and saw her go to confession to Messire Guillaume, who was then our Curé. When all was well at the chateau, the Seigneurs and their ladies often came to walk beneath the Ladies' Tree, on the Sunday of Laetare, which we call 'the Sunday of the Wells'; and on certain other days,in fine weather, they brought with them the village boys and girls. The Seigneur Pierre de Bourlement and his lady, who was from France, took me there on the said Sunday of the Wells many times in my childhood, with other children. It was the custom to go every year, on this Sunday, to play and walk round this tree. Jeannette went with us, we each brought provisions, and, the meal ended, went to refresh ourselves at the Well. The same thing takes place now, with our children. MENGETTE, wife of Jean Joyart, laborer. My father's house joined the house of Jacques d'Arc: so I knew her well. We often spun together, and together worked at the ordinary house-duties, whether by day or night. She was a good Christian, of good manners and well brought up. She loved the Church, and went there often, and gave alms from the goods of her father. She was a good girl, simple and pious so much so that I and her companions told her she was too pious. MESSIRE JEAN COLIN, Cure of the Parish Church at Domremy and Canon of the Collegiate Church of Saint-Nicolas de Brixey, near Vaucouleurs. While Jeanne was at Vaucouleurs, she confessed to me two or three times. It seemed to me, to my knowledge, that she was an excellent girl, with all the signs of a perfect Christian and of a true Catholic; she was fond of going to Church. I saw her at Vaucouleurs, when she wanted to go into France, and saw her mount on horseback; with her were Bertrand de Poulengey, Jean de Metz, Colet de Vienne, horse soldiers and servants of Robert de Baudricourt. COLIN, son of Jean Colin, laborer. I heard Durand Laxart say, that she told him he must conduct her to Vaucouleurs, that she wished to go into France, and that she would tell her father she was going to the house of the said Durand to nurse his wife. And this, Durand told me, was done; and then, with the consent of her father, she went to Vaucouleurs to seek Robert de Baudricourt. MICHAEL LEBUIN, laborer, of Domremy. I knew Jeannette from my earliest youth. Of Jeanne's departure for Vaucouleurs I knew nothing. But, one day-the Eve of Saint John the Baptist (June 23rd, 1428.) - she said to me: "Between Coussy and Vaucouleurs there is a young girl, who, before the year is gone, will have the King of France consecrated." And, in truth, the following year the King was crowned at Reims. (July 17th, 1429.) When Jeanne was a prisoner I saw Nicolas Bailly, Notary of Andelot, coming to Domremy, one day, with several other persons. At the request of Jean de Torcenay, Bailly of Chaumont for the pretended King of France and England, he proceeded to make inquiries into the conduct and life of Jeanne. But he could not induce the inhabitants of Vaucouleurs to depose. I believe they questioned Jean Begot, at whose house they were staying. Their inquiry revealed nothing against Jeanne. I saw Jeanne the Maid when she came to Maxey-sur-Vays. (Near Vaucouleurs.) When Jeanne came to Maxey, she came sometimes to my house. I always thought her a good girl, simple and pious. Many times I heard her speak; she said that she wished to go into France. NICOLAS BAILLY, Tabellion (Notary) and Deputy Royal at Andelot. As Tabellion I was appointed by the Sieur Jean de Torcenay, Knight, then Bailly of Chaumont, by the authority of the pretended King of France and England, and, with me, the late Gerard Petit - then Provost of the said Andelot (The village of Domremy, although the territory of Lorraine, belonged to France, not to Lorraine; for administrative purposes it was a dependence of Champagne.) - to proceed to an inquiry on the subject of Jeanne, at that time detained in prison at Rouen. Many times, in her youth, I saw Jeanne before she left her father's house: she was a good girl, of pure life and good manners, a good Catholic who lovedthe Church and went often on pilgrimage to the Church of Bermont, and confessed nearly every month as I learned from a number of the inhabitants of Domremy, whom I had to question on the subject at the time of the inquiry that I made with the Provost of Andelot. When I and the late Gerard made this inquiry, we examined twelve or fifteen witnesses. Afterwards, we certified the information before Simon de Thermes, Squire, Lieutenant of the Captain of Montclair.